Landing pages are an established part of the online marketing conversion funnel, typically arrived at from a banner or Google AdWords ad. If you are paying money for your advertising and your conversion rates aren’t as good as you’d like them to be, the simplest thing (well not entirely simple, but sensible) to do is to optimize your landing page. The increase in ROI you can gain from landing page optimization far outweighs what you can achieve by simply buying more traffic. This is why we wrote our white paper or ebook, to provide some insight into the many methods you can employ today to boost your conversion rates. 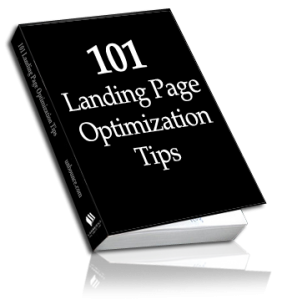 Our free 26-page landing page eBook contains 101 ways to do just that. If you find it useful, we’d love it if you’d share it around with your colleagues and maybe give us some Re-Tweet love if you use Twitter.